At least 20 people were killed and over 50 injured when Kalashnikov-wielding Taliban suicide bombers stormed a crowded minority Shia mosque in Pakistan’s restive northwest during Friday prayers, opening fire and exploding bombs in a revenge attack, the latest in a series of sectarian violence to hit the country. The attack comes exactly two weeks after a suicide bombing inside a packed Shia mosque in Pakistan’s Sindh province during the Friday prayers killed 61 people, including children, in the deadliest sectarian attack to hit the country in recent times. The Tehreek-e-Taliban Pakistan (TTP) claimed responsibility for the attack at the Imamia Masjid Imambargah in the posh Hayatabad area here where worshippers had gathered for the ‘Zuhr’ afternoon Friday prayers and warned that Friday’s was the first in a series of revenge attacks. The Imambargah is situated close to several government buildings, including the local passport centre and the Federal Investigation Agency offices. At least three explosions and gunfire was heard. A doctor of Hayatabad Medical Complex, where the bodies and the injured were taken, said that 20 people have been killed and about 50 suffered wounds in the attack. Four suicide attackers were involved in the attack, said Shafqat Malik, chief of bomb disposal unit that defused one suicide bomber’s jacket. Three attackers – who entered the mosque carrying grenades and Kalashnikovs – exploded their vests while one was killed by security forces, Malik said. Head of the provincial police Nasir Durrani said an attacker was killed by worshippers at the mosque. “People here showed great courage. They grabbed one of the attackers from his neck, and he couldn’t detonate (his explosives), and he was shot and killed,” Durrani added. The style of Friday’s attack bore a striking similarity to the December 16 Peshawar carnage, in which the gunmen arrived in a car, set it on fire and broke into the building using a back entrance. In a video sent by email to reporters, TTP said the attack was revenge for Pakistan’s crackdown on militants following the school massacre. “Either Pakistan will become your graveyard, or God’s law, sharia, will be implemented,” Taliban commander Khaleefa Omar Mansoor said in the video in which he was flanked by three young militants touting AK-47 assault rifles. “This is the first in a series of revenge attacks… Wait for the rest,” said Mansoor, who had earlier claimed responsibility for the Peshawar school attack in which 150 people, including 136 children, were killed. An eyewitness said Friday prayers were being offered when armed men wearing security forces’ uniform entered the mosque and hurled grenades at the security personnel deputed at the premises. The militants exchanged fire with security forces for nearly two and a half hours, police said. Television footage showed images of people running frantically as the area was covered with thick smoke. According to an eyewitness, over 800 people were present inside the mosque when the attack occurred. Prime Minister Nawaz Sharif and President Mamnoon Hussain strongly condemned the attack. 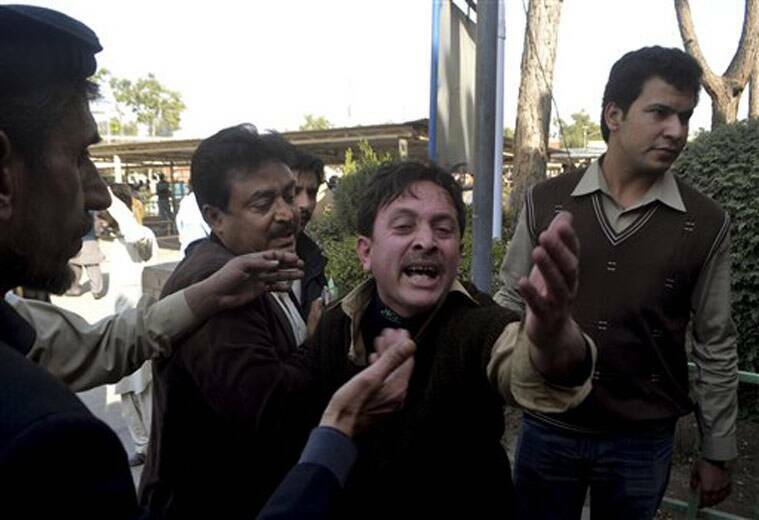 Political leaders, including Pakistan Tehreek-i-Insaf Chairman Imran Khan, also expressed grief over the incident. Security and rescue operation teams were dispatched to the area, with forces cordoning off the site for further inspection. Hayatabad was under heavy surveillance as helicopters hovered over the area and dozens of security personnel took position to clear the vicinity.